fuels, and other fluids, presented a strong environmental challenge. The use of a “hardscape” cover system was designed into the project and included large concrete pads and diversion areas. These areas were used to support the heavy machinery along with diverting hazardous runoff into designed containment systems. The concrete overlay would be used as a working platform and could be viewed as a primary boundary layer for containment. But a more permanent and long-term secondary barrier was needed. This extra layer would need to provide protection from operational leaks and spills caused by both the automobiles being recycled and the recycling machinery. It would also need to protect against liquid and gas phased hazardous waste. The use of a geomembrane was immediately thought of as the required secondary containment liner. These typical liners are commonly used as a liquid impermeable surfaces. However, the typical HDPE or LLDPE geomembranes are not suited for containing gas phased hazardous waste or other naturally occurring gases. The runoff for this facility would contain VOCs in the form of benzene, toluene, ethylbenzene, and xylene. All needed to be contained for proper environmental protection. To accomplish the task of liquid and gas phased containment, the designers relied on the use of the Absolute Barrier. This seven-layer co-extruded lining system contains an outer core of polyethylene (PE) for liquid containment, just like a normal geomembrane. The special nature of this material lies within the core of its multilayered construction. Within the Absolute Barriers core lies a layer of EVOH (ethylene vinyl alcohol). EVOH is used widely as a barrier film in the food packaging and specialty containment industries. 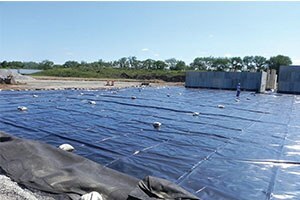 The use of EVOH as a geomembrane is new and it now allows designers and regulators the option to better contain both the liquid and gas phased hazardous waste on environmental sites. With the addition of EVOH, the Absolute Barrier line of geomembranes can now protect against VOCs, methane, nauseous odors, and even Radon. Even better, the installation procedures for this special lining system are the same as common PE liners.